The stainless steel machine tags and valve tags are avaiable ina variety of shapes and sizes. They are laser engraved making a permanent black/dark grey imprint. These machine tags and valve tags are widely used for industrial purposes. This stainless steel tag is made of 20 gauge 304 stainless steel. The machine tag has a rectangular shape with concave corners and a hole on the left and right. The stainless steel machine tag is laser engraved producing a permanent black/dark grey marking. A sample is available upon request. 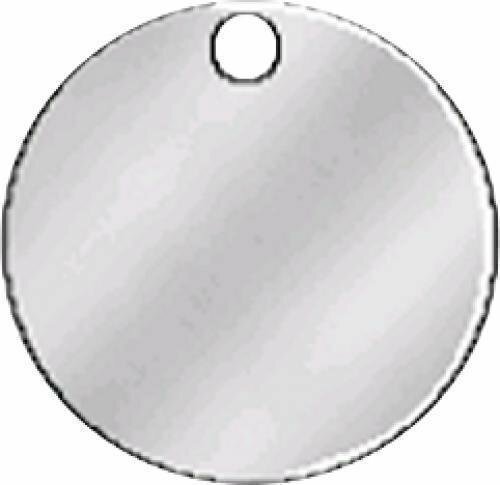 Size: 1-7/16" x 3-1/16" Hole Dia: 5/32" Center-to-Center: 2 19/32"
This stainless steel tag is made of 20 gauge 304 stainless steel. 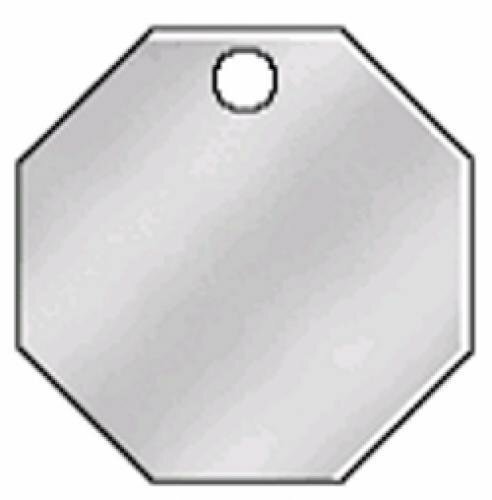 The machine tag has an octagon shape with a hole on the top and is frequently used as a valve tag. The stainless steel machine tag is laser engraved producing a permanent black/dark grey marking. A sample is available upon request. Size: 1 1/4" Hole Dia: 3/16"
Size: 1 1/8" Hole Dia: 3/16"
Size: 1 1/2" Hole Dia: 3/16"
This stainless steel tag is made of 20 gauge 304 stainless steel. The machine tag has an oval shape with a hole on the left and right. The stainless steel machine tag is laser engraved producing a permanent black/dark grey marking. A sample is available upon request. Size: 1-5/32" x 2-1/16" Hole Dia: 1/8" Center-to-Center: 1 3/4"
Size: 3/4" x 1-11/32" Hole Dia: 3/32" Center-to-Center: 1 3/32"
Size: 1" x 1-7/8" Hole Dia: 1/8" Center-to-Center: 1 1/2"
This stainless steel tag is made of 20 gauge 304 stainless steel. The machine tag has a rectangular shape with slightly rounded corners and a hole on the left and right. The stainless steel machine tag is laser engraved producing a permanent black/dark grey marking. A sample is available upon request. Size: 1" x 2" Hole Dia: 1/8" Center-to-Center: 1 11/16"
Size: 1/2" x 1 9/32" Hole Dia: 1/8" Center-to-Center: 1"
Size: 3/4" x 1 3/4" Hole Dia: 1/8" Center-to-Center: 1 1/2"
Size: 5/8" x 2 1/2" Hole Dia: 1/8" Center-to-Center: 2 1/4"
Size: 1" x 2 1/2" Hole Dia: 1/8" Center-to-Center: 2 1/4"
Size: 1" x 3" Hole Dia: 1/8" Center-to-Center: 2 1/2"
Size: 1-1/2" x 3" Hole Dia: 1/8" Center-to-Center: 2 5/8"
Size: 2" x 4" Hole Dia: 1/8" Center-to-Center: 3 5/8"
Size: 3"??x? ?5" Hole Dia: 1/8" Center-to-Center: 4? ?5/8"
This stainless steel tag is made of 20 gauge 304 stainless steel. The machine tag is round with a hole on the top and is frequently used as a valve tag. The stainless steel machine tag is laser engraved producing a permanent black/dark grey marking. A sample is available upon request. 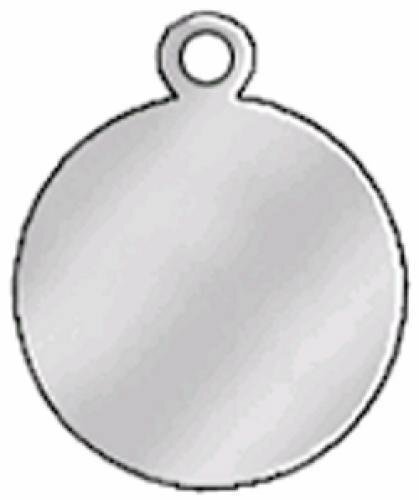 Size: 1" Hole Dia: 3/16"
Size: 1 3/8" Hole Dia: 3/16"
Size: 2" Hole Dia: 3/16"
This stainless steel tag is made of 20 gauge 304 stainless steel. The machine tag is round with an extended ear that contains the hole. The stainless steel machine tag is laser engraved producing a permanent black/dark grey marking. A sample is available upon request. 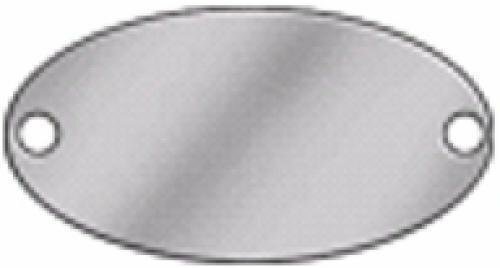 Size: 1 1/4" Hole Dia: 11/64"
Size: 1" Hole Dia: 7/64"
This stainless steel tag is made of 20 gauge 304 stainless steel. The machine tag has 2 rounded sides and a hole on the left and right. The stainless steel machine tag is laser engraved producing a permanent black/dark grey marking. A sample is available upon request. Size: 5/8" x 1 29/32" Hole Dia: 1/8" Center-to-Center: 1-9/16"
Size: 5/8" x 2 13/16" Hole Dia: 5/32" Center-to-Center: 2-13/32"
Size: 3/4" x 3 1/8" Hole Dia: 5/32" Center-to-Center: 2-25/32"
Size: 1" x 2 1/8" Hole Dia: 1/8" Center-to-Center: 1?13/16"
This stainless steel tag is made of 20 gauge 304 stainless steel. 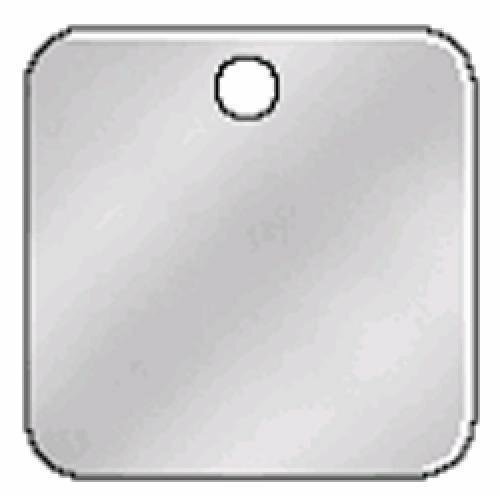 The machine tag has a square shape with a hole on the top and is frequently used as a valve tag. The stainless steel machine tag is laser engraved producing a permanent black/dark grey marking. A sample is available upon request.